 Through its Health and Social Services Committee, the Quebec Community Groups Network works to ensure the interests of our community are protected and that our rights to access health and social services in our own language are respected. Regional Access Committees (one per administrative region). The mandate of these committees is to participate in the creation of regional access plans. the approval, evaluation and modification by the Government of each access program developed by an institution in accordance with section 348 of the Act. The identification of organizations that promote the interests of English speakers in each region. These organizations will be consulted regarding the appointment of members of regional committees for English-language health services and social services access programs. four members residing on the territory of the other health regions of Quebec. Members of the Provincial Committee serve in a personal capacity. They do not represent an organization or a social or political group. This is intended to prevent any conflicts of interest. The composition of the Committee is intended to be as representative as possible of Quebec’s English-speaking population. Members are appointed for three years and their mandate can be renewed only once. In its presentation to the National Assembly committee studying Bill 10: an Act to modify the organization of the health and social services network, in particular by abolishing the regional agencies, the Quebec Community Groups Network presented detailed arguments on how the proposed legislation not only threatens our English health institutions and the access to health and social service for Quebec’s English-speaking community which are key to its ability to survive and thrive, it eliminates them. The English-speaking community of Quebec’s right to the delivery of health and social services in English is enshrined in provincial law in the Health and Social Services Act, commonly referred to as S 4.2. This was the case prior to the adoption of Bill 10. Bill 10 adopted in February 2015, did not replace the Health and Social Services Act, often referred to as S 4.2. But it substantially changed certain of its provisions. In particular, it radically altered the way in which Quebec’s public health and social services system is administered. The Government of Quebec has created a Provincial Committee (PC) on the delivery of health and social services in English. The committee is sometimes referred to as the Provincial Advisory Committee, but ‘Advisory’ is not part of its official title. The Government of Quebec has created Regional Access Committees on the delivery of health and social services in English. Each of Quebec’s Health Regions (two Aboriginal Health Regions excepted) is required to have a Regional Access Committee. The committees are referred to simply as Regional Committees in the legislation. Access Programs have been part of the process of making government funded health and social services available in English in Quebec since the 1980s. Essentially an Access Program is an inventory for a given region of which services are available in English, and where they can be accessed. Upon request, Bill 10 provides for the creation of a new volunteer committee (Advisory Committee) in each and every merged institution under the responsibility of a Centre Intégré (CI). Bill 10 did not directly change anything that affects the legal foundation or the governance of such foundations, but the consequences of Bill 10 do have direct and real impacts on the way foundations interact with the institution they support which is now merged into another, new institution with a different name. The institutions merged under Bill 10 into a Centre Intégré (CI) were merged by amalgamation or by grouping. Under merger by amalgamation the merged institution loses its legal identity and therefore no longer exists as an institution. The new CI assumes all of the responsibilities, liabilities and assets of the merged institution, including human resources and property. One way in which those required to utilize the services of the health and social services network administered by the province can ensure that their rights are respected, including their access to services in English, is by referring to and/or participating in a Users’ Committee or a Residents’ Committee (also know as inpatient committees). Adoption of Bill 10 did not modify the complaints regime established by the Act respecting health services and social services (S 4.2). However, mention of the complaints regime is included in these Infosheets to remind interested readers that it exists, and can be used with respect to issues related to access to health and social services in English. The number of reported complaints on this topic is quite low. This may be because users are satisfied with access to services in English. But other information suggests that there is a level of dissatisfaction with respect to access to certain types of services, and in certain institutions that exists but is not manifested by official complaints. The Health and Social Service Committee is an advisory committee of the Board of Directors. The committee’s mandate is to inform the English-speaking community and its organizations of the changes made to the Health and Social Service network. The committee also works with organizations that represent the English-speaking community to assure that representatives of the community occupy the seats available on the boards of integrated health boards, aka CISSSs and CIUSSSs, installation advisory committees, Regional Access Committees, Users’ committees, foundation boards and owning corporation members. It also acts on behalf of the QCGN Board to represent the interests of the English-speaking community of Quebec to the Ministère de la Santé et des Services sociaux and other stakeholders. 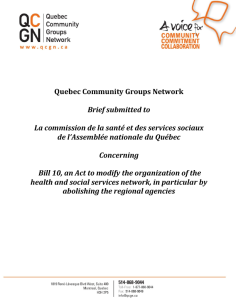 The QCGN coopted members of its Bill 10 Reference Group to form a Standing Committee on Health and Social Services. The Committee’s mandate is to inform the community of changes to the health and social services network; to ensure the continuing engagement of community members in our institutions; and to represent the interest of the community to the Ministère de la Santé et des Services sociaux, the newly created Centres Intégrés and other important stakeholders. It was clear from the outset that the work of this Committee is vital and that it will require significant support and resources. As issues arise the need for resources to support volunteers is increasingly urgent.